Point Pleasant defenders Nick Parsons (42) and Ryan Duff (75) chase down Mingo Central’s Daylin Goad (3) for a tackle during Saturday’s Class AA playoff opener at OVB Field in Point Pleasant, W.Va.
Point Pleasant senior quarterback Cason Payne breaks away from a pair of Mingo Central defenders during Saturday’s Class AA playoff opener at OVB Field in Point Pleasant, W.Va.
POINT PLEASANT, W.Va. — You could say that the Big Blacks ran away with this one, or you could even argue that they went on the defensive. Phrase it however you’d like, but the Point Pleasant football team is — once again — moving on to the quarterfinals. 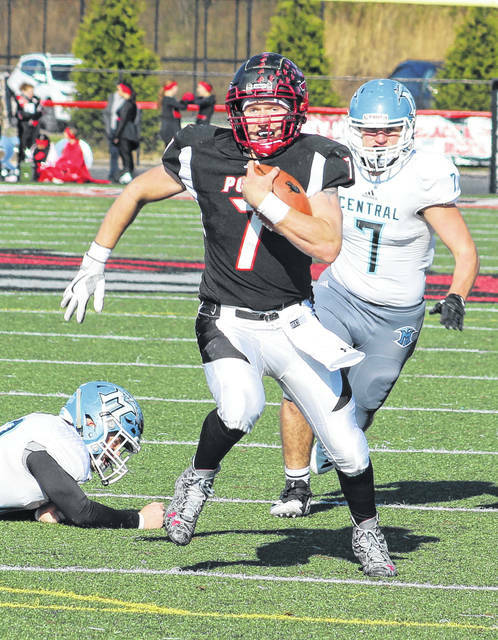 Point Pleasant rushed for 483 yards and outscored visiting Mingo Central by a 36-7 margin after halftime en route to a 65-36 victory Saturday afternoon in a Class AA opening round playoff contest at Ohio Valley Bank Track and Field in Mason County. The eighth-seeded Big Blacks (9-1) never trailed in the contest, but the ninth-seeded Miners (8-3) never trailed by more than one possession in the first half and ultimately managed to match the Red and Black on a point-by-point basis over the opening 24 minutes of action. Tied at 29-all coming out of the intermission, the hosts used a pair of quick-strike drives to cover 175 yards in just six plays combined — giving the Big Blacks a 43-29 advantage with 7:45 remaining in the third period. MCHS answered quickly as Drew Hatfield returned the ensuing kickoff 76 yards to the house, again pulling the contest to within a possession at 43-36 with 7:34 left. 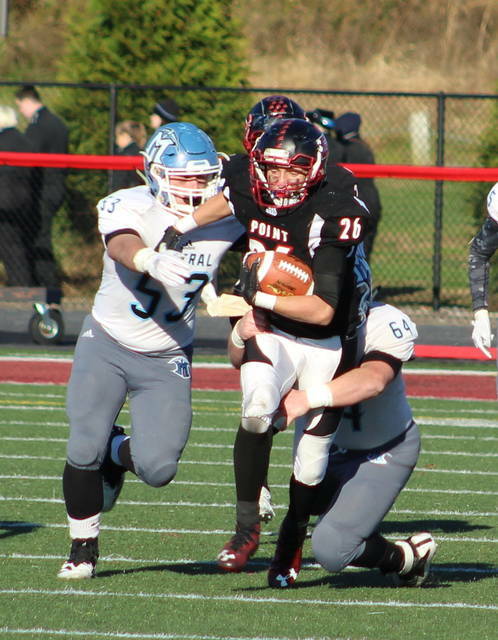 The Miners — who averaged 45.4 points and 464 yards of total offense per game in the regular season — did not score the rest of the way, plus didn’t produce a single offensive point in the second half against a Point Pleasant defense that allowed only 94 yards and seven first downs after the break. Senior quarterback Cason Payne — who had six rushing touchdowns in the contest — tacked on his final two scores at the 3:56 and 2:16 marks of the third period, giving Point a comfortable 58-36 cushion headed into the finale. Junior Brady Adkins tacked on the last of his three rushing touchdowns with 11:01 left in regulation, wrapping up what proved to be the final 29-point outcome. The Big Blacks were actually 22 yards off the pace (301-279) set by Mingo Central in the first half, but the hosts ended the day with a sizable 647-395 advantage in total yards of offense. Point also averaged just a shade under 11 yards per carry on 44 total rushing attempts. 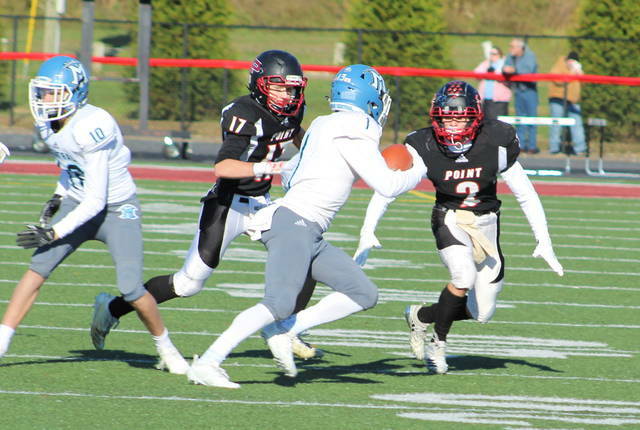 Point Pleasant has now won its opening round playoff game in each of the last six postseasons — all at OVB Field — and will travel to top-seeded Fairmont Senior (11-0) for a Saturday afternoon quarterfinal contest at 1:30 p.m.
For now, however, 12th-year PPHS coach David Darst was really pleased with what he witnessed from his troops on this afternoon — particularly against such a formidable foe. “It’s been a great day. We played a great football team that can score some points and they have some really great playmakers. I was really proud that our offense was able to match their offense, but our defense really made the difference there in the second half,” Darst said. “We made some adjustments at halftime and held that offense to a goose egg. To be able to do that against a high-powered offense like that, that’s just a tremendous effort. 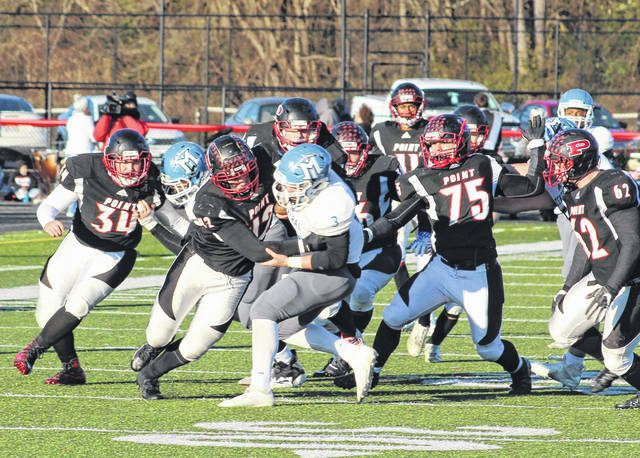 Payne — who had TD runs of 13, 8, 49, 81, 10 and 2 yards while amassing 242 rushing yards on 18 carries — became the only Point Pleasant quarterback in school history to win an opening round playoff game in four consecutive postseason starts under center. 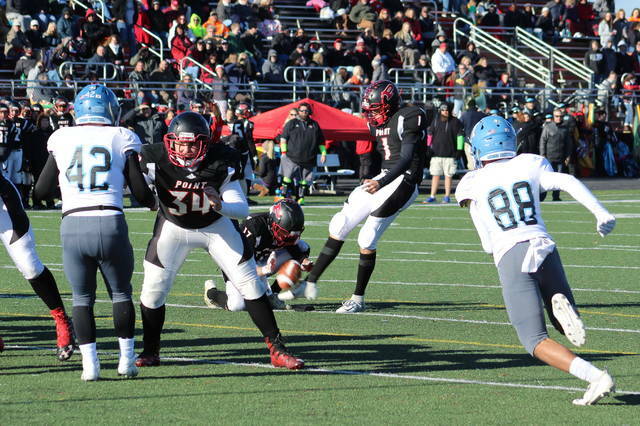 The dual-threat southpaw noted that he couldn’t think of a more fitting end for both his classmates and himself in wrapping up remarkable prep careers at OVB Field. He was also thankful to have at least one more game to play in the Red and Black. “Today was fun, although they had us worried with the way they were hanging around in the first half,” Payne said. “We made some good adjustments at halftime and they weren’t able to score another point on our defense. That was impressive in itself, plus the way we just kept executing when we had the ball. The game actually started as a defensive struggle as both teams turned the ball over on downs on their opening drives. Point Pleasant, however, came up with the first big play as Josh Wamsley intercepted a Daylin Goad pass on Mingo Central’s first play of its second possession — giving Point the ball at the MCHS 12 with 5:39 remaining in the first period. The hosts needed only two plays and 10 seconds to cover the distance as Adkins rumbled in from a yard out, giving PPHS a 7-0 edge. The Miners were forced to punt on their ensuing drive, but Isa Scales recovered a fumble on Point’s first offensive snap and returned the ball to the Point 37. Six plays later, the score ended up tied at seven as Drew Hatfield caught a 6-yard pass from Goad with 1:13 left in the opening canto. The Big Blacks answered with a 7-play, 65-yard drive that ended with Payne’s first rushing score at the 11:19 mark for a 14-7 edge. MCHS responded with an 8-play, 72-yard drive that ended with a 24-yard TD pass from Goad to Hatfield —again tying the contest at 14-all with eight minutes left until halftime. Point bounced back with a 7-play, 64-yard drive that ended with Payne scoring from eight yards out. Wamsley added a successful 2-point conversion run for a 22-14 lead with 4:53 remaining. The Blue and Black needed just five plays to strike back as the guests capped a 59-yard drive on a 13-yard Hatfield run. Jacob Nagy successfully hauled in a 2-point conversion pass from Goad for a 22-all contest with 2:45 left until the break. Payne added his third TD run of the first half — this time from 49 yards out — while ending a 3-play, 79-yard drive with 1:56 left for a 29-22 edge. Mingo Central, however, covered 66 yards in four plays to knot things right back up as Goad scrambled in from five yards out with 42 seconds left. Point received the second half kickoff and went 80 yards in four plays while establishing a permanent lead. Adkins broke off a 40-yard run with 10:58 left in the third period, giving the hosts a 36-29 edge. 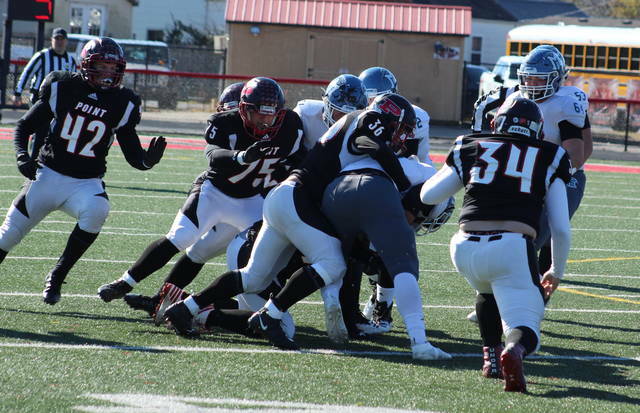 The Miners punted on their ensuing drive, then the Big Blacks needed only two plays to cover 95 yards while taking its first double-digit advantage of the afternoon. Payne rumbled 81 yards to paydirt and gave PPHS a 43-29 cushion with 7:45 left in the third. Hatfield answered with the kickoff return to close the deficit back down to seven, but the Big Blacks retaliated with their longest drive of the game — a 10-play, 60-yard drive that ended at the 3:56 mark as Payne scored from 10 yards out. PPHS also had a 5-play, 57-yard drive end on Payne’s 2-yard run with 2:16 left in the third. Point Pleasant — which is now 6-0 all-time in Saturday afternoon games at OVB Field — claimed a 24-18 edge in first downs and also received a perfect 8-for-8 effort from Oliver Skeie on PAT kicks. Zane Wamsley had a fumble recovery in the fourth quarter. Nick Parsons also recorded a sack for the hosts, who did not have a punt in the triumph. Adkins followed Payne with 151 rushing yards on 15 carries, while Christian Holland added 40 yards on six tries. Payne was also 11-of-17 passing for 164 yards. Adkins led the receivers with 98 yards on four catches. James Musgrave was next with 30 yards on two grabs, while Josh Wamsley had 20 yards on three catches. The Big Blacks were penalized three times for 25 yards, while the guests were flagged 10 times for 59 yards. Both teams committed two turnovers apiece, while the Miners punted twice for an average of 38 yards. Goad led Mingo Central with 81 rushing yards on 16 carries and was also 27-of-43 passing for 286 yards, including two scores and one interception. MCHS mustered only 109 rushing yards on 25 attempts. Hatfield led the receivers with 12 catches for 125 yards and two scores. Scales added seven catches for 82 yards in the setback. It is the first time in five postseasons that Mingo Central has not won a playoff game. The Big Blacks now turn their attention to the Polar Bears, who defeated Lewis County on Saturday afternoon by a 56-6 margin. FSHS are the defending Class AA runner-up and are in the postseason for a sixth straight year. According to the final rankings, the Polar Bears are the team to beat in double-AA this postseason. With recent playoff games against former state champions Wheeling Park (2015) and Bluefield (2017), Darst notes that this isn’t the first time that his players have faced top-shelf talent from other sides of the state. The venerable mentor also believes that his kids — and the coaching staff — are looking forward to at least one more game on the gridiron, even if the seeding isn’t to their advantage.